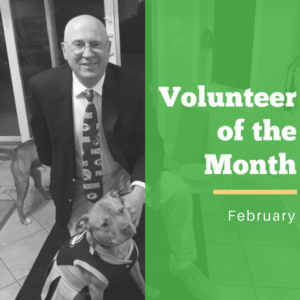 This month’s featured volunteer is our dedicated dog walker John W.! Inspired by his wife’s service, John joined us two years ago, to not only help dogs in need but stay fit as well. Thanks to his retirement, he can donate 4-5 mornings a week to giving our resident pups their first morning walks and playtime. In addition to walking dogs, John also helps clean kennels, transport dogs for out-of-town appointments and train new volunteers. Because of the happiness he’s experienced, he encourages others to join him in feeling good about giving back to your community. When asked about a memorable moment, John reflects on the joy he feels when seeing the dog’s he has helped care for, find their forever homes. Currently, he’s hoping to feel that joy again soon with one of our longest residents, Hercules. Thank you, John, for your continued support and dedication!